Now that our friends at Kansas Pregame have released their 2016 edition digitally, we can officially announce that Susan Goodwyn has been awarded the Grand Prize for the 2015 Kpreps Friday Night Photo Contest. Goodwyn’s winning photo captures a unique perspective of St. Thomas Aquinas kicker Blake Zuniga’s point-after-touchdown against Blue Valley North. 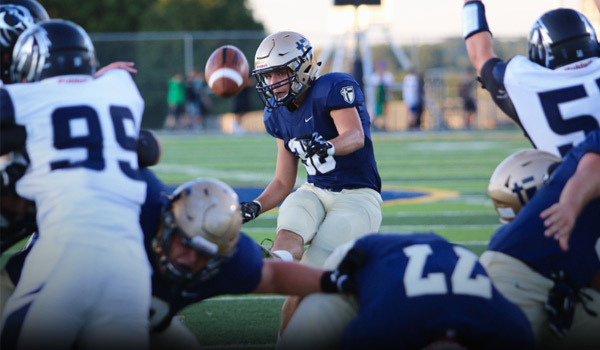 Aquinas went on beat Blue Valley North 42-13 in a Week 2 Eastern Kansas League showdown. Both the Saints and Mustangs would go on to reach the state playoffs in their respective classifications. Goodwyn wins $500 cash for her 2015 winning photograph. The winning photo was announced and featured (page 42) in the 2016 edition of Kansas Pregame Magazine.